At times when I get notification that someone has liked or commented on my photo, I have to click on that Notification to go to that actual photo and then see which photo my friends have liked. Sometimes I get frustrated as I have to click on all the notifications in my list to check each like or comment. Looks like Facebook is soon going to get us rid of that annoying moment. Now the photo that your friend liked or commented on Facebook will appear next to the notification in Facebook Notification bar. This new feature like many others was not officially declared by Facebook. Till yesterday it was not their in my account but today morning when I logged into Facebook to see few of my notifications , I noticed this feature. 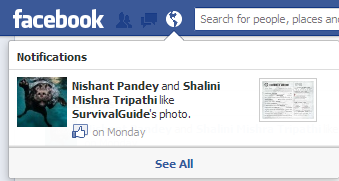 It could either be a beta testing or Facebook may actual start to roll out this feature for most of the users. Here is how photos will appear in your Facebook Notification bar. As you may have noticed that there is small thumbnail which will appear next to the notification. You may not need to go to the actual photo to see the new likes but you have go to photo to see the comment your friend just posted. This feature is available both for profiles and Facebook pages.